Tuesday - Thursday 10 a.m. - 2 p.m. Please call ahead if coming from a long distance to ensure room is open. Phone (517) 543-8792. Appointment may be made for other hours; Contact us by phone or e-mail; Please contact at least 72 hours in advance. For research requests, visit the Send A Request page. Our society is run entirely by volunteers. We enjoy providing a limited amount of research for you from our library resources and will get to yours as soon as volunteers are available. Thank you! For a list of people who may be able to help you with more research (for a fee), see our Researchers page. We are launching a project to honor Eaton County Vietnam Era Veterans! We would like to identify as many veterans as we can who are connected to Eaton County. This project will be used initially to collect some genealogical, military and whatever memories and stories the veteran would like to share, and photo(s), especially in uniform. Our goal is an eventual publication for the society. We are asking Vietnam War Era Veterans to fill out a form and send to us (click here). If you are a loved one or friend of a veteran who is no longer living, please fill out a form (click here) for the veteran to be included! See more complete information on the Vietnam Era Project portion of the Military Special Interest Group. Forms are also available at our ECGS office during open hours and at the Charlotte Community Library. They are being distributed in libraries, American Legions, VFWs and other locations throughout the county. The old Eaton Township tax books are available for research at our library! Click here for a list. Instructions for Searching Eaton County Digitized Newspapers! We have instructions that describe how to use the Fulton History website to search the digitized Eaton County newspapers from the Eaton County History Newspaper Project. These Instructions are in a pdf file, which you may download if you wish. (Please note: Not all of the newspapers shown with browse links are currently working. Hopefully they will sometime in the future.) The List of Newspapers is a pdf file, which you may download if you wish. The Search-Examples is an Excel file and will immediately download to your computer if you click on this. This file gives examples of searches and you can then change the examples to your own criteria and copy them to the search box on the Fulton History website. If you do not have Microsoft Excel, or do not wish to download an Excel file, here is the Search-Examples pdf version of this file. To learn more about more about our project to digitize Eaton County Newspapers, visit echnp.org . Donations gratefully appreciated. 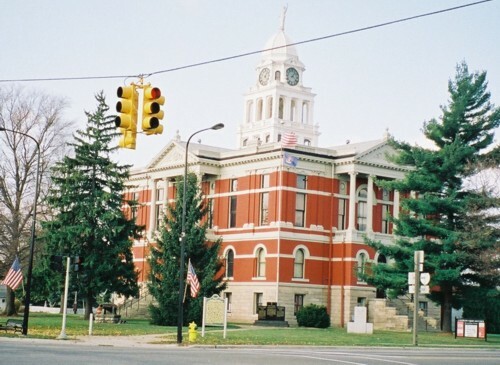 See the instructions our member Sue Thompson wrote for our newsletter readers to Search for Older Eaton County Probate Packet images on Family Search! These Eaton County Probate Packets are available at Family Search. See our Scanned Files Lists web page for new lists of scanned files and/or folders of images. One list contains scanned images of holdings we physically have in our library. The other list contains images that we mostly do not physically have. Note: These scanned files ARE NOT available on our website because of web space limitations! See our Membership. page. Payment may be made by Pay Pal and application may be submitted on-line! Would you like to know more about your fellow members? Some members would like to see a Membership Book - where members can share their ancestor surnames, other organizations and skills/software they know how to use. See the Membership Book page for more information!